Just like in modern population, early medieval people wore mittens and gloves for various reasons. In this article, we will show how these mittens and gloves looked and what was their possible function. This material section contains leather and fur mittens and gloves. Mittens and gloves made of leather protect against cold, heat and bruises. They can also fulfil an aesthetical function as they adhere to the body well. Four finds come from the 7th century. Grave No. 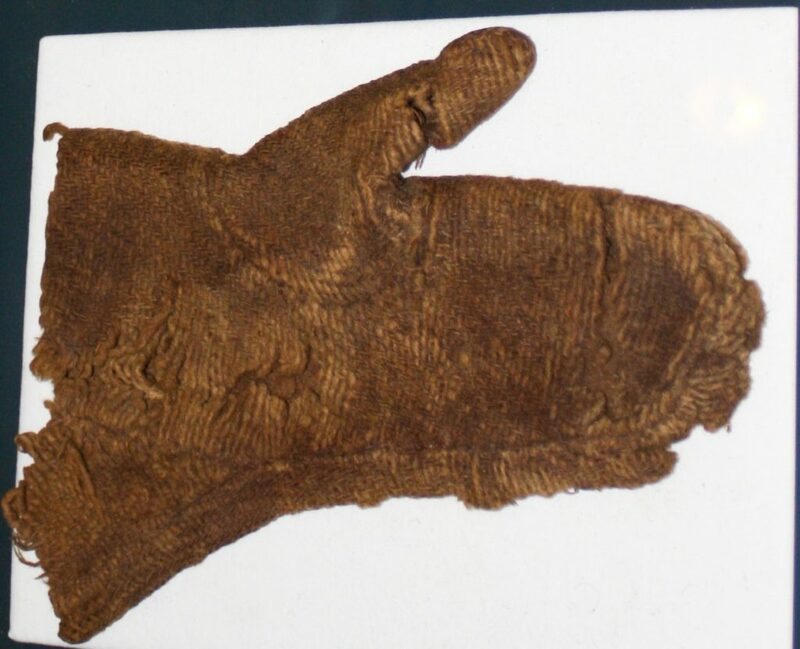 17 in Oberflacht, Germany contained “a strange pair of mittens with thick folds on the back and underlined with soft, almost ruined fabric” (Dürrich – Menzel 1847: 11). A very similar example, made of a fine leather lined with linen, was found in the rich grave from Greding, Bavaria (Mord im Mittelalter 2012). The third example is a mitten decorated with an intertwined application from the boy’s grave from Cologne Cathedral, Germany (Gillich et al. 2008: 8-11). The fourth mitten is a fragment of goatskin decorated with an intertwined application from the grave no. 8 in St. Ulrich’s and St. Afra’s Abbey, Augsburg (Werner 1977: 163). 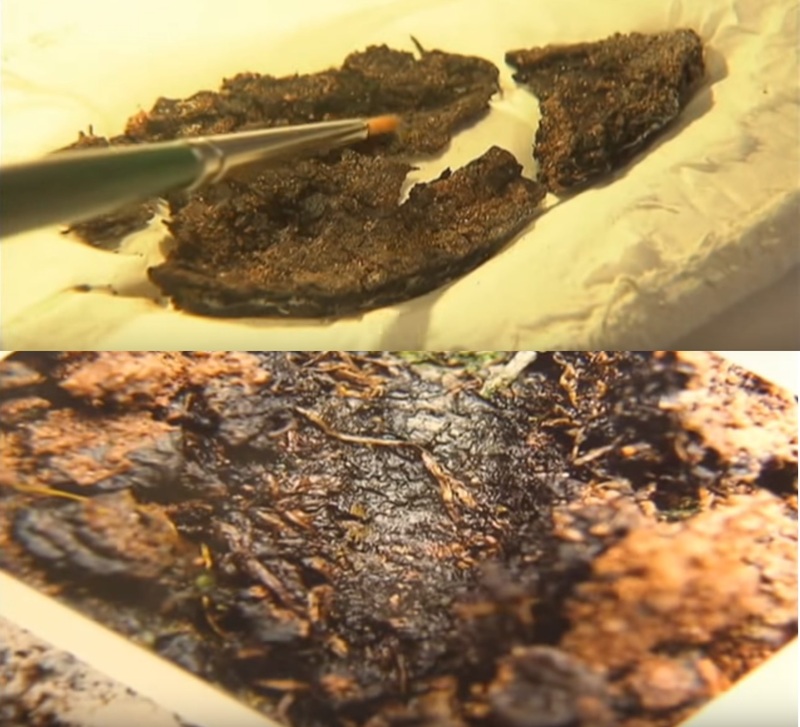 Danish Hjørring Museum contains fragments of presumable mittens from the Viking Age made of lambskin, which were preserved probably thanks to being stored in a bronze vessel. Next suitable material comes from the Caucasus. 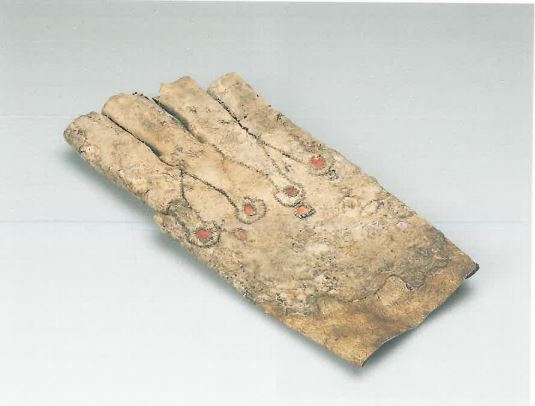 It is a fingerglove from Moscevaja Balka, which probably belonged to a woman due to its size and is made of soft lambskin, decorated by sewn-on ribbons and red morocco leather circles on the knuckles (Jerusalimskaja 2012: 212, Пл. 130). Fingertips of this glove seem to be open so the last phalanxes were bare. Another Caucasian mittens from the period of 8th to 10th century are located in Metropolitan Museum, New York (Kajitani 2001: 90, Fig. 8). These mittens also leave phalanxes bare. If we looked into the Middle Ages in Europe, we would find a solid tradition of leather mittens described as “work mittens” in archeological literature (Dahlbäck 1983: Fig. 201, Fig. 202; Williemsen 2015: 8–11). We can find these in the areas of present Denmark (Svendborg), Germany (Lübeck, Schleswig), Netherlands, Norway (i.e. Trondheim), Poland (Wrocław), Russia (Pskov, Novgorod), Sweden (Stockholm) and Great Britain (London) (Schnack 1998: 74–78; Williemsen 2015 and the Unimus catalogue). Medieval leather mittens were typically made of lambskin and cow leather (Mould et al. 2003: 3222; Williemsen 2015: 12). 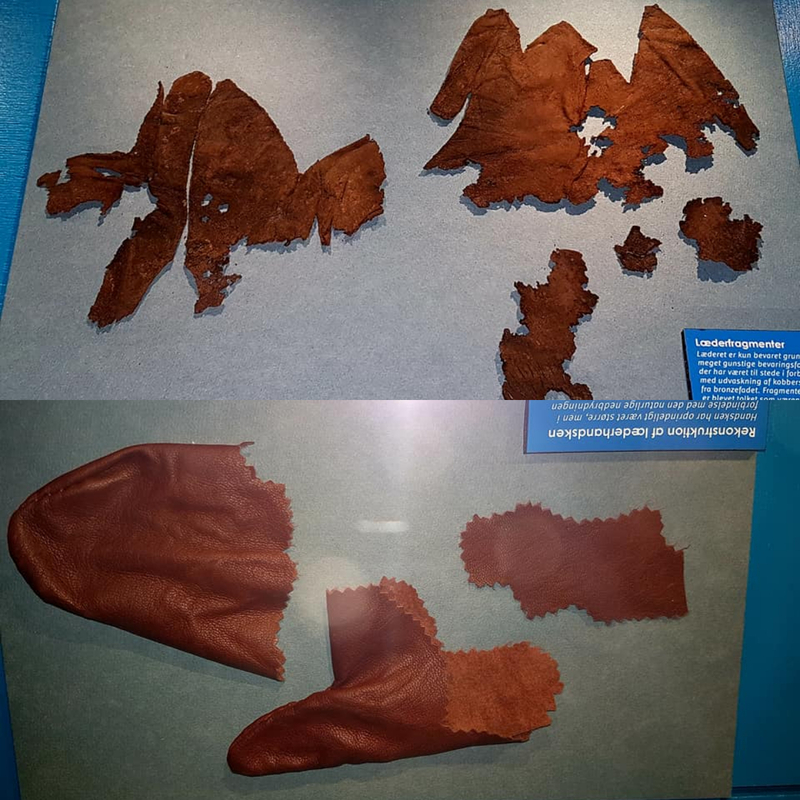 Presumable fragments of leather mitten, find and reconstruction. Museum of Hjørring, photographed by Elin Sonja Petersen. 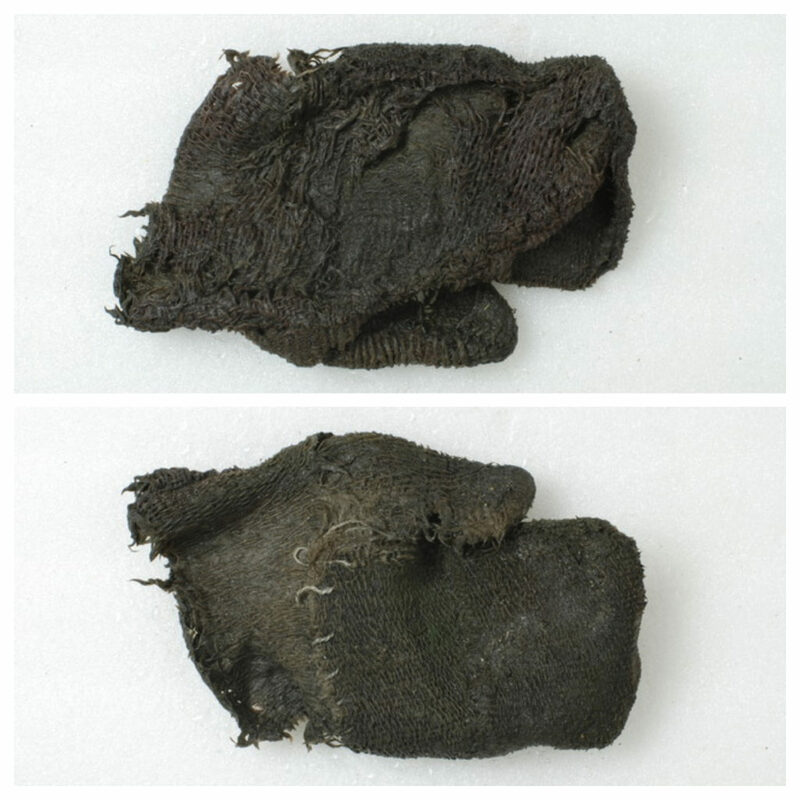 Fragments of leather mitten made of fine leather lined with linen. Rich grave from Greding, Bavaria, around 700 AD. Mord im Mittelalter 2012. Leather mitten decorated with an application, Cologne Cathedral. Gillich et al. 2008: 10. 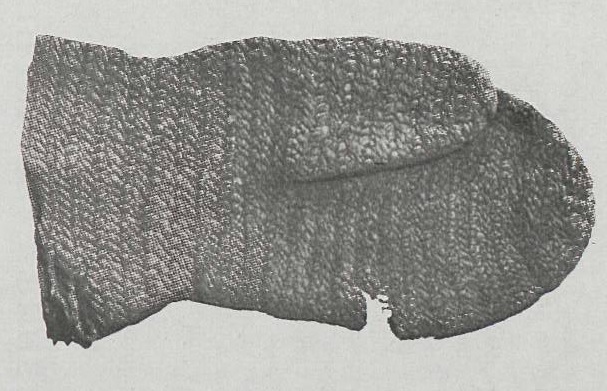 A fragment of goatskin mitten decorated with an application. Grave no. 8 in St. Ulrich’s and St. Afra’s Abbey, Augsburg. Martin 1988: Abb. 5; Peek – Nowak-Böck 2016: Abb. 28-29; Gillich et al. 2008: 12-13. Leather mittens from Moscevaja Balka (Jerusalimskaja 2012: Пл. 130). 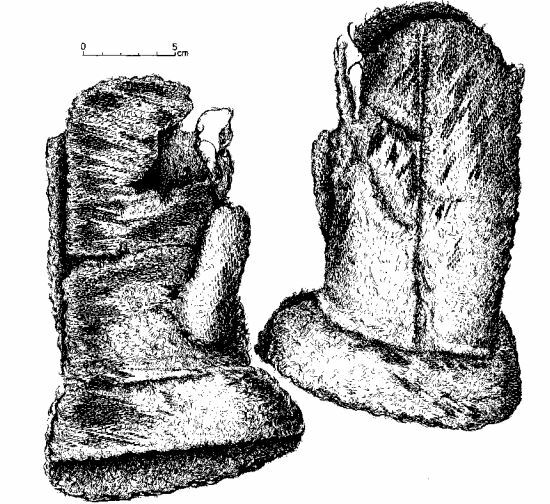 Caucasian leather mittens (Kajitani 2001: 90, Fig. 8). Mittens made of fur with hair inside seem to have a practical sense especially against coldness. Right hand mitten from Old Ladoga made of sheepskin in 8-9th century (Ojateva 1965: 50, Рис. 3 : 1) can be mentioned among early medieval finds. In the Saga of Eiríkr the Red (3), there is a seer who wears “mittens of cat fur with white hair inside”. Mitten made of sheepskin, Old Ladoga, 8.–9th century. Ojateva 1965: Рис. 3 : 1. Mittens made of wool were among the most popular ones. Methods of their manufacture could differ. Felting is a method of weaving fibers of wetted woven fabric in order to make a hardier, rain-proof textile. Two pieces which can be related to felt mittens can be found in the literature. One is the fingerless mitten from Dorestad, Netherlands (7–10th century), which is made of two pieces of brown dyed, felted wool fabric originally sewn from herringbone textile (Brandenburgh 2010: 69; Miedema 1980: 250–254). Simple rectangular cover is thickened by a sewn-on square on the palm side. 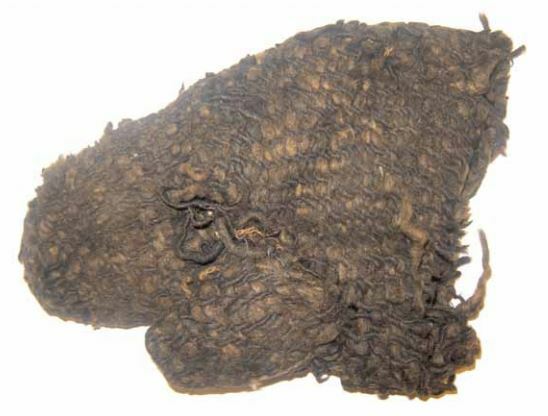 Brown felt fragment, perhaps originally belonging to a nålebound mitten, was found inside a grave in Finnish Halikko Rikala location and is dated to the 11th century. (Vajanto 2014: 24–25). Felt mittens were used also in medieval Netherlands (Williemsen 2015: 4–5). Simple two-pieced mitten from Dorestad. Miedema 1980: Pl. 24, Fig. 174. Mittens made by nålbinding technique were apparently popular in early Middle Ages, as shown by their geographic and chronological spread (Vajanto 2014: 22; Walton 1989: 341–345). That was because of their flexibility and sturdiness, which were essential especially in case of socks and mittens. Factual evidence comes from Iceland and Finland. The Icelandic mitten was found in the ruins of Arneiðarstaðir farmstead together with a bronze ringed-pin dated to 10th cenutry (Hald 1951). Nålebound fragments were found in at least five Finnish, mostly women’s graves from 11th century (Eura Luistari 56, Halikko Rikala 38, Kaarina Kirkkomäki 31, Köyliö Köyliönsaari 28, Masku Humikkala 30) near the hands, which suggests that the body was put into the grave wearing mittens (Vajanto 2014: 25). Such fragments were often striped or embroidered; in case of the striped variants it was a combination of dark and light thread or a combination of blue, white and red shades (Vajanto 2014: 25–26). In case of the Finnish mittens, it is presumed that protection against cold was not their primary function as some burials occured in other seasons than winter, some dyes were not amongst the standardly used ones and the fragments did not imply using thumbs (Vajanto 2014: 30). Mitten found in the ruins of Arneiðarstaðir farmstead. 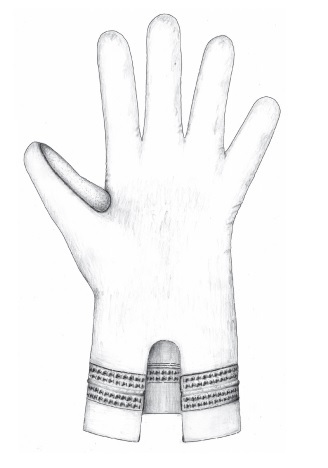 Presumable fragment of a mitten and its possible reconstruction. Vajanto 2014: Figs. 2, 6, 7. Mittens which were cut and sewn from a woven fabric with no underlining were probably the most frequently used of all. Presently we document three mittens on Iceland, one on the Shetland Islands, one in Norway, two in Germany and one in Netherlands. We will begin with the Icelandic ones. In the year 1881, in the place of former farmstead of Garðar on Akranes, a mitten was found that could be dated to the farmstead’s origin, which means 9-10th century. (Pálsson 1895: 34–35). The mitten is four-pieced – front and back part, sewn-in thumb and an inset – left-handed and assuming from its wrist width, it was worn over upper clothing. It is interesting that the manufacturer used 2/2 twill with inwoven pile of unspun short tufts of brushed wool for the mitten, with the tufts functioning as an isolation (Guðjónsson 1962: 21–22). 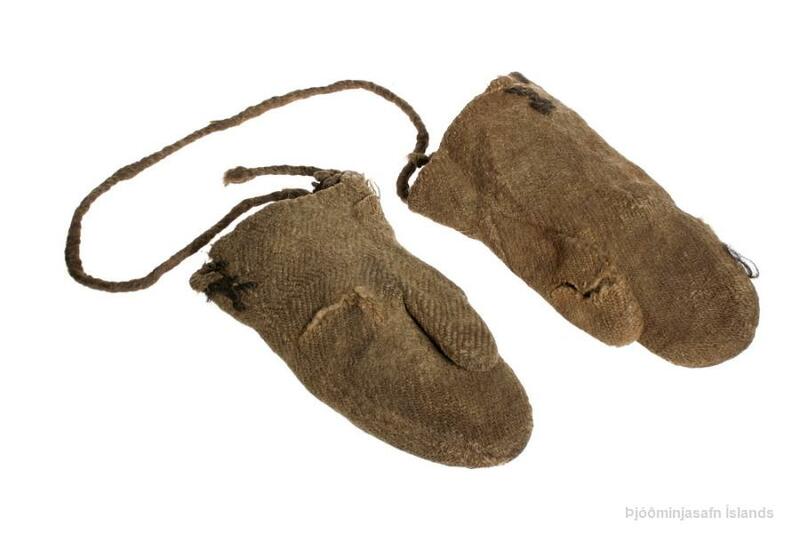 The remaining two Icelandic mittens were found together and therefore present the only preserved pair. They were found on Heynes in 1960 (Guðjónsson 1962: 16). These are evidently children’s mittens and they are connected with a sewn-on lace that could be threaded through sleeves, so the child would not lose them. These were probably made from re-used material which originally had a different function (Guðjónsson 1962: 30). The mittens are therefore unlike: right one is made of three pieces (main frame and two opposite pieces for the thumb), while the left one is four-pieced (two opposite pieces for the frame and two opposite pieces for the thumb). Thumb holes are not on the edge, instead they are placed with certain spacing. 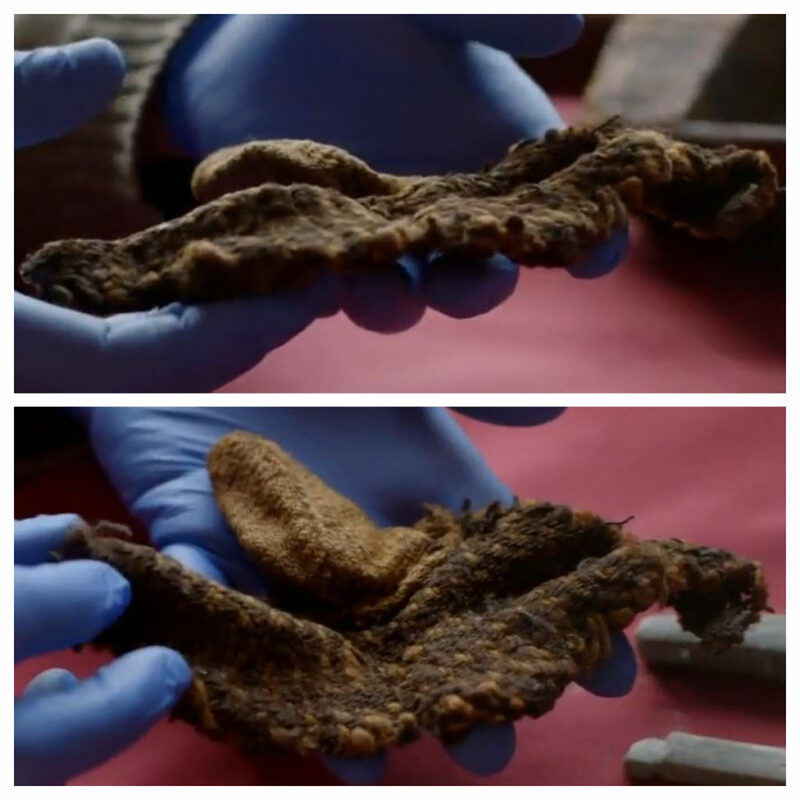 Another mitten made of rough woven wool was found on Shetlands during peat extraction (Vikings 2012). It was carbon-dated to 975, which is unfortunately the only detail we know. A presumably left-handed mitten was found in 2011 on the melting Lendbreen iceberg in Norway, conservatively estimated to be from the years 800–1000. It seems that this mitten was composed of at least four pieces: back, thumb and two-pieced palm. 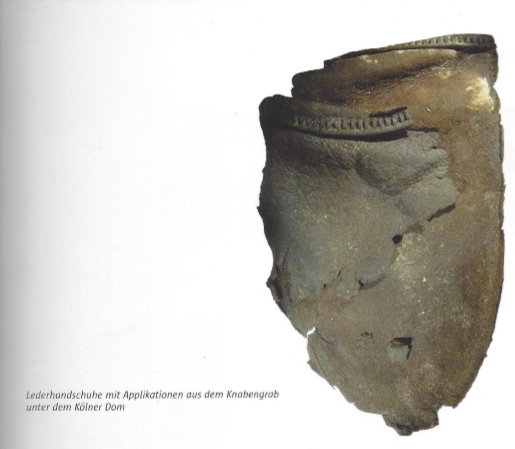 One German mitten was found in Ralswiek and it is dated to 8–9th century (Herrmann 1985: 288, Abb. 136). This one has a seam alongside its whole length and its wrist collar presents a standalone piece. The second German glove or mitten comes from the grave no. 58 in Trossingen, 6th century; the glove was made of red, yellow and black fabric that was decorated with an intertwined leather application and a reinforced leather thumb (Peek – Nowak-Böck 2016: 385-390). We should also mention the presumably right-handed mitten from Aalsum, Netherlands, which is dated to 8–10th century. The only known detail we have is that the warp threads are of average or small width and therefore density, while the weft threads are very thick and therefore have a low density per square centimeter. This solution, probably aiming to save material, can be also seen in cases of mittens from Garðar and Shetlands. Moreover, the mitten from Aalsum was also sewn together with a very thick thread. As far as we know, there is one written evidence of feather mitten from the early Middle Ages. 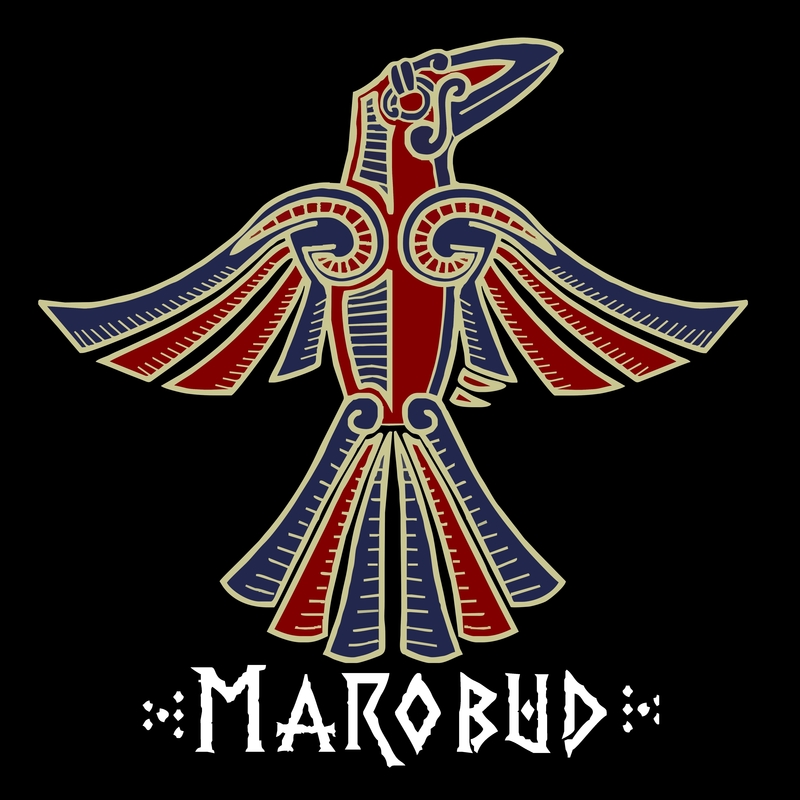 It can be found in Haraldskvæði (verse 6) by Þorbjǫrn hornklofi, where it can be read that the ruler Haraldr Fairhair wore mittens stuffed with downy feathers – probably of an eider – in his youth (or child years). This verse compared a matured man willing to sail and fight even in winter and a spoiled boy who rather spends the winter in women’s part of the palace and wears feather mittens on his hands. From the context of this mitten we can perceive it as pertaining to a wealthy child’s apparel. Mitten from Garðar, Iceland. Photography by dolbex. Pair of mittens Heynes, Iceland. Mitten from the Shetland Islands. Vikings 2012. Mitten from the Lendbreen iceberg in Norway. Photos taken from Unimus.no catalogue. Woolen mitten from Ralswiek (Herrmann 1985: 288, Abb. 136). Possible look of the glove / mitten from the grave no. 58, Trossingen, 6th century. Peek – Nowak-Böck 2016: Abb. 26. Mitten from Aalsum, Netherlands. Brandenburgh 2010: Fig. 22. Early Middle Ages provide us with only decent traces of iron mail being used as a hand protection. The most important find of this kind comes from grave no. 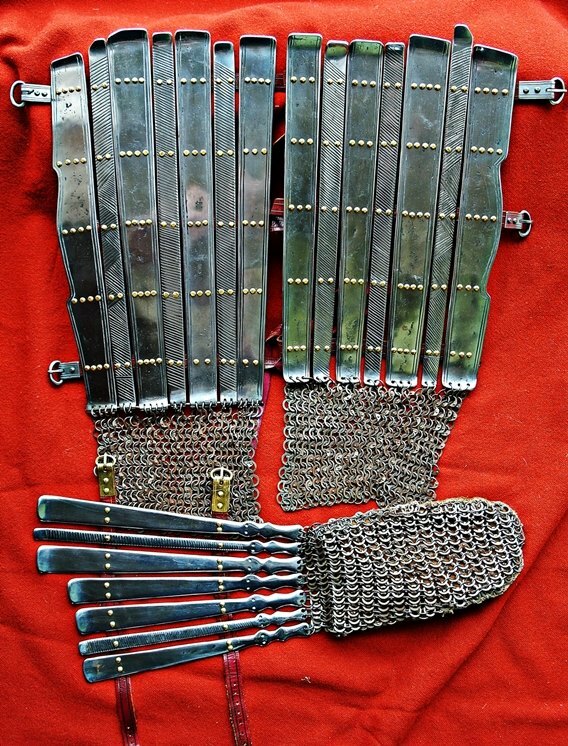 8 in Swedish Valsgärde, which contained guards for both legs and one hand, originally misinterpreted as chestplate (Arwidsson 1939; Arwidsson 1954). Iron mail was most probably attached to these guards and in case of the right hand it was used as a coating of the presumably leather mitten or glove (Vike 2000). This find is dated to the 7th century. That is the same for another probable find, a fragment of iron mail from grave no. 119 in Castel Trosino, Italy, which was found near the deceased body’s hand (Beatson 2011–12). If we extended our search outside Europe, we could for example find scale gloves used in the area of present Iran. Probable reconstruction of limb protection from Valsgärde 8. A fragment of iron mail from grave no. 119 in Castel Trosino, Italy. Simple fingerless warmers fulfiling the function of mittens were documented in the area of present Netherlands, specifically the felt mitten from Dorestad. Fingerless form is speculated also in case of Finnish nålebound mittens, which were preserved without thumbs, however this could be a coincidence. We encountered no medieval analogy to this find. That is probably because this was a very primitive and impractical manner of hand protection. Variously constructed mitten seems to be the most common early medieval shape and is continued until today. We assume it to occur in leather, textile and even metal variations. A mitten with its fingertips bare presents a specific variation known from the Caucasus. Norse myths also refer to mittens (related to the myth described in Gylfaginning 45). Aside from the Trossingen and Caucasian specimens we described earlier, it is supposed that finger gloves were not widespread in continental Europe until the 12th century. Even three finger gloves cannot be confirmed for the early Middle Ages despite their significant popularity in 14-16th century (Williemsen 2015: 18–20). The most presumed function is definitely protection against cold. Many mittens were undoubtedly intended to keep the hand warm and this aim was supported by additional protection – fur (Old Ladoga, Saga of Eiríkr the Red), inwoven tufts of wool (Garðar) or feathers (Haraldskvæði). We can assume that children’s mittens (Heynes, Haraldskvæði) were designated to keep their hands warm. One of the mittens (Lendbreen) was found on an iceberg with a popular tradition of reindeer hunting, which can be considered as an evidence of the mitten’s function. 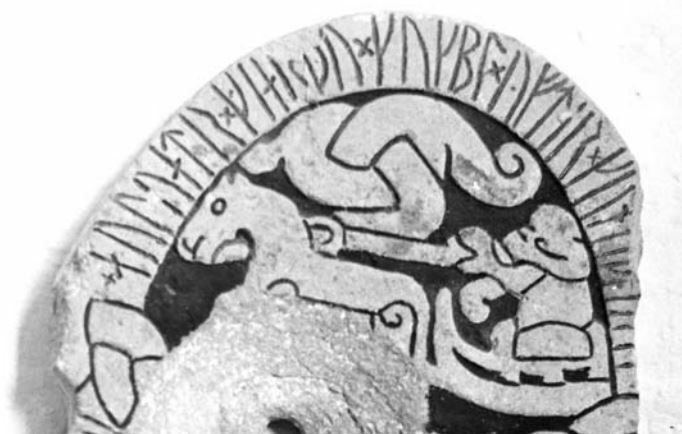 Moreover, a mitten was displayed on a 11th century runestone from the church in Sproge (G 373), Gotland, depicting a sleigh rider wearing mitten on his hand while driving horses (Snædal – Gustavson 2013: 43–48). Horse-drawn sleigh on the runestone G 373 from Sproge, Gotland, 11th century. Snædal – Gustavson 2013: 45. It is logical that mittens were not only worn in wintertime during transport (horses, sleigh, ski, skates, ships). They were used while hunting, pulling ropes on a ship, fishing, tar making, plowing, herding, woodcutting, peat mining and other outdoor activities which could take place in bad weather. We could expect mittens being used while working at a forge. Nevertheless, this assumption is not confirmed; early medieval iconography depicts blacksmiths wearing no mittens nor gloves, sometimes also with their sleeves pulled up. The closest material can be found in a Norse myth referring to iron mittens enabling one to grab heated metal (Skáldskaparmál 26). The noble art of falconry has often included wearing leather mittens, which provide better features against the bird’s grip. As far as we know, we have only two pieces of evidence for falconer’s mittens being used in early medieval Europe. The older one comes from a Byzantine mosaic inside so called Falconer’s Villa in Aros, Greece, which dates to the 6th century (Wallis 2017: Illus. 2). The newer source comes from an Anglo-Saxon cross in Bewcastle, England and is dated to 7-8th century (Wallis 2017: 430). 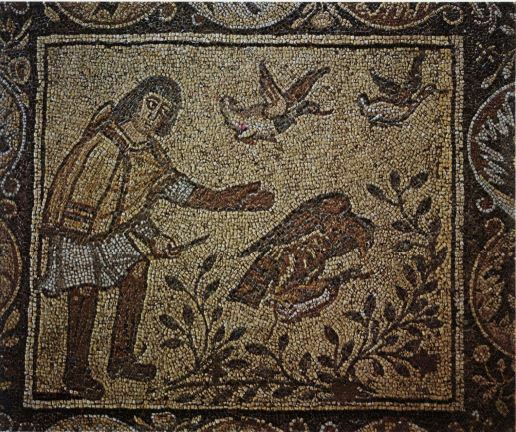 In the rest of falconry scenes, for example on the Bayeux tapestry, people do not wear hand protection and have their birds of prey on bare hands (Owen-Crocker 2004: 265). Even skaldic kennings related to falconry do not mention hand protection. It is therefore legitimate to wonder if these cultural products reflect the reality trustworthily. Falconry scenes of 12th century and further periods already contain finger gloves (i.e. Schnack 1998: 48). Mosaic inside the Falconer’s Villa. Argos, Greece, 6th century (Wallis 2017: Illus. 2). 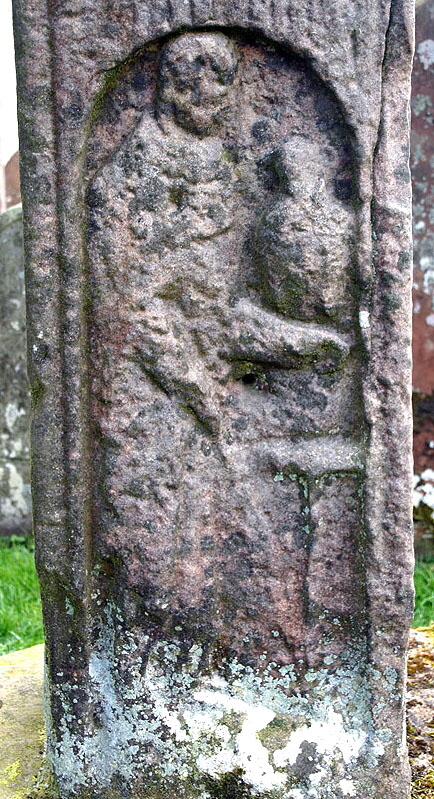 Falconry scene on a cross in Bewcastle. Despite many historical parallels and common sense we are unable to prove other than rare use of protective hand protection during a fight. Mittens or gloves coated with iron mail present the only exceptions. As it seems, the absence of protection in sources is not caused by ravages of time, but instead by a different approach to this issue. The fighters apparently preferred fine motorics, were able to effectively block with their shields and in battle they mostly used a combination of shields and pole weapons. But most importantly, no kind of period protection could fully protect against all weapon types. We have already attended the issue here in more detail. The very same problem pertains also to archer’s gloves which could not be confirmed. Nevertheless, gloves and mittens could also fulfil an aesthetical function on the hands of wealthy and powerful. We saw they could be custom-made, painted, embroidered (Finnish mittens), decorated with expensive materials (Moscevaja Balka) or stuffed with deluxe padding (Haraldskvæði). They could therefore serve as a symbol of status to some extent, which is apparent especially in case of rulers and church representatives. We will mention two illustrative examples. Mittens are mentioned in the last will of Anglo-Saxon noble called Byrhtnoth, who leaves a “pair of skilfully crafted gloves“ (Owen-Crocker 2004: 265), and they also appear as a gift in the Saga of Njál (31), where the king bestows leather mittens embroidered with gold. Gylfaginning = Gylfiho oblouzení. Přel. Helena Kadečková. In: Snorri Sturluson. Edda a Sága o Ynglinzích. Praha: Argo, 2003, 37–101. Skáldskaparmál = Jazyk básnický. Přel. Helena Kadečková. In: Snorri Sturluson. Edda a Sága o Ynglinzích, Praha: Argo, 2003, 102–144. Saga of Eiríkr the Red = Sága o Eiríkovi Zrzavém. Přel. Ladislav Heger. In: Staroislandské ságy, Praha, 1965: 15–34. Saga of Njál = Sága o Njálovi. Přel. Ladislav Heger. In: Staroislandské ságy, Praha, 1965: 321–559. Þorbjǫrn hornklofi : Haraldskvæði = Þorbjǫrn hornklofi : Haraldskvæði (Hrafnsmál), ed. R. D. Fulk. In: Skaldic poetry of the Scandinavian Middle Ages. Vol. 1, [Poetry from the kings’ sagas 1 : from mythical times to c. 1035], ed. Diana Whaley, Turnhout, 2012: 91–117. Arwidsson 1939 = Arwidsson, Greta (1939). Armour of the Vendel period. In: Acta Archaeologica 10, København, 31–59. Arwidsson 1954 = Arwidsson, Greta (1954). Valsgärde 8. Uppsala: Almqvist & Wiksells Boktryckeri. Beatson 2011–12 = Beatson, Peter (2011–12). Armour in Byzantium in the early years of the Varangian Guard, with special reference to limb defenses. Available from: http://members.ozemail.com.au/~chrisandpeter/limb_defences/limb_defences.htm. Brandenburgh 2010 = Brandenburgh, Chrystel R. (2010). 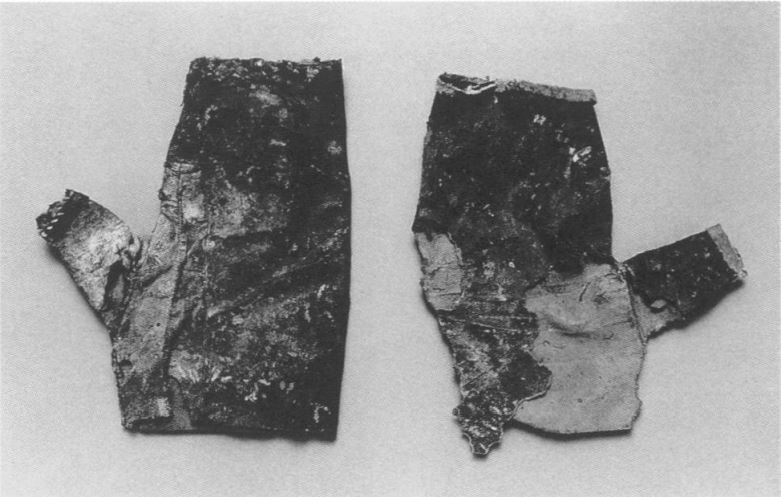 Early medieval textile remains from settlements in the Netherlands. An evaluation of textile production. In: Journal of Archaeology in the Low Countries 2/1, 41–79. Dahlbäck 1983 = Dahlbäck, Göran (red.) (1983). Helgeandsholmen : 1000 år i Stockholms ström, Stockholm. Dürrich – Menzel 1847 = Dürrich, Ferdinand von – Menzel, Wolfgang (1847). Die Heidengräber am Lupfen (bei Oberflacht), Stuttgart : Arnold. Gillich et al. 2008 = Gillich, Antje – Peek, Christine – Planck, Dieter – Walter, Susanne (2008). Kleidung im frühen Mittelalter: Am liebsten schön bunt! (Porträt Archäologie), Esslingen am Neckar. Guðjónsson 1962 = Guðjónsson, E.E. (1962). Forn röggvarvefnaður. In: Árbók Hins íslenzka fornleifafélags 1962, Reykjavík, 12–71. Hald 1951 = Hald, Maragrethe (1951). Vötturinn frá Arnheiðarstöðum. In: Árbók Hins íslenzka fornleifafélags 1949–50, Reykjavík, 73–77. Herrmann 1985 = Herrmann, Joachim (1985). Die Slawen in Deutschland. Geschichte und Kultur der slawischen Stämme westlich von Oder und Neisse vom VI. bis XII. Jahrhundert. Ein Handbuch, Berlin. Kajitani 2001 = Kajitani, Nobuko (2001). A Man’s Caftan and Leggings from the North Caucasus of the Eight to Tenth Century: A Conservator’s Report. In: Metropolitan Museum Journal 36, 85–124. Jerusalimskaja 2012 = Иерусалимская, А.А. (2012). Мощевая Балка. Необычный археологический памятник на Северокавказском шёлковом пути, СПб. Miedema 1980 = Miedema, M. (1980). Textile finds from Dorestad, Hoogstraat I and II. In: W. A. van Es – W. J. H. Verwers (eds). Excavations at Dorestad I, The Harbour: Hoogstraat I, (Nederlandse Oudheden 9), Amersfoort, 250–261. Mord im Mittelalter 2012 = Mord im Mittelalter – Das Fürstengrab von Greding (Hans Peter Kernstock, Germany, 2012), discussion with Britt Nowak-Böck, 0:12:54–0:17:19. Mould et al. 2003 = Mould, Q., Carlisle, I, Cameron, E. (2003). Craft Industry and Everyday Life: Leather and Leatherworking in Anglo-Scandinavian and Medieval York. The small finds 17/16, York. Ojateva 1965 = Оятева, Е.И. (1965). Обувь и другие кожаные изделия Земляного городища Старой Ладоги //Археологический сборник Государственного Эрмитажа, вып. 7, 42–59. Owen-Crocker 2004 = Owen-Crocker, Gale R. (2004). Dress in Anglo-Saxon England, Woodbridge : The Boydell Press. Pálsson 1895 = Pálsson, Pálma (1895). Um myndir af gripum í forngripasafninu. In: Árbók Hins íslenzka fornleifafélags 1895, Reykjavík, 30–35. Peek – Nowak-Böck 2016 = Peek, Christian – Nowak-Böck, Britt (2016). Die Untersuchungen an organischen Materialien des Grabes 58 von Trossingen (Lkr. Tuttlingen) – Vorbericht. In: Fundberichte aus Baden-Württemberg, Bd. 36, Esslingen am Neckar, 367-404. Schnack 1998 = Schnack, Christiane (1998). Mittelalterliche Lederfunde aus Schleswig: Futterale, Riemen, Taschen und andere Objekte ; Ausgrabung Schild 1971–1975. Ausgrabungen in Schleswig Berichte und Studien 13, Neumünster. Snædal – Gustavson 2013 = Snædal, Thorgunn – Gustavson, Helmer (2013). Supplement till Gotlands runinskrifter 1 : Sudertredingen : G 360 – G 386 samt tillägg till inskrifterna G 32, G 49, G 50, G 76, G 79, och G 104, Stockholm : Riksantikvarieämbetet. Vajanto 2014 = Vajanto, Krista (2014). 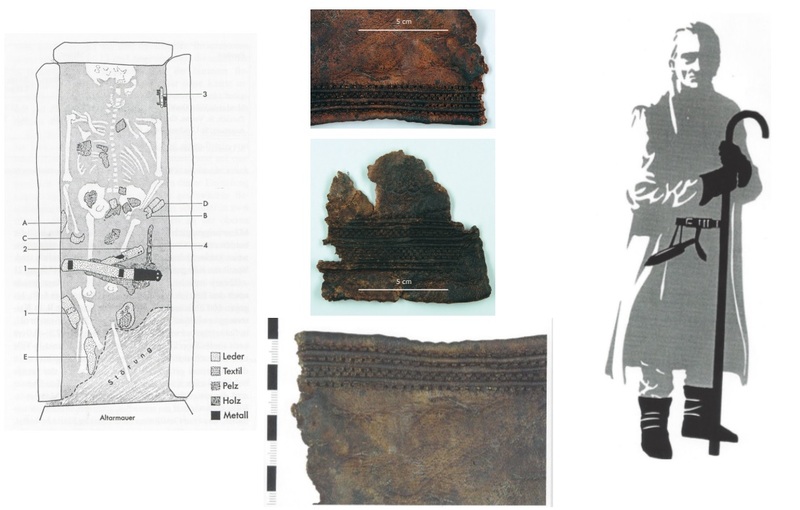 Nålbinding in Prehistoric Burials – Reinterpreting Finnish 11th–14th-century AD Textile Fragments. In: Janne Ikäheimo, Anna-Kaisa Salmi & Tiina Äikäs (eds.). Sounds Like Theory. XII Nordic Theoretical Archaeology Group Meeting in Oulu 25.–28.4.2012. Monographs of the Archaeological Society of Finland 2, 21–33. Vikings 2012 = Vikings, episode 3 (Jon Eastman – Rosie Schellenburg – Simon Winchcombe, Great Britain, 2012), discussion of Niel Oliver with Dr. Ian Tait, 0:08:30–0:10:41. Wallis 2017 = Wallis, R. J. (2017). “As the Falcon Her Bells” at Sutton Hoo? Falconry in Early Anglo-Saxon England. In: Archaeological Journal, 174 (2), 409–436. Walton 1989 = Walton, Penelope (1989). Textiles, Cordage and Raw Fibre from 16-22 Coppergate. York Archaeological Trust: 17/05, London. Werner 1977 = Werner, Joachim (Hrsg.) (1977). Die Ausgrabungen in St. Ulrich und Afra in Augsburg 1961-1968, Augsburg. Williemsen 2015 = Williemsen, Annemarieke (2015). The Geoff Egan Memorial Lecture 2013 : Taking up the glove: finds, uses and meanings of gloves, mittens and gauntlets in western Europe, c. AD 1300–1700. In: Post-Medieval Archaeology 49/1, 1–36.